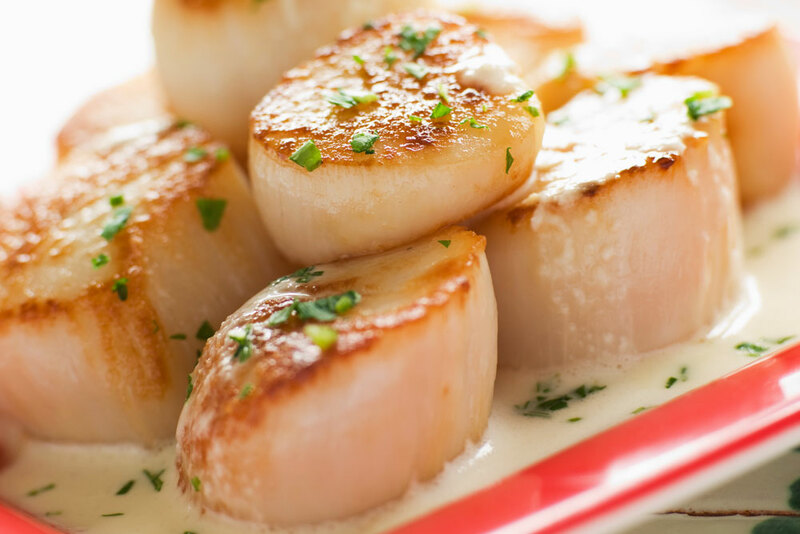 The scallop, a bi-valve, is considered to be the most delicious shellfish. Vladivostok is different from other Russian cities because it combines European and Asian sensibilities. The nearby Sea of ​Japan, and the resources of the local forests (referred to as “the Ussuri taiga”), as well as the city’s proximity to Asian countries give the local cuisine an Asian flavor. Long ago, the Ice Age completely engulfed this territory, which is why in the coastal forests neither animals nor plants exist anywhere. Locals like to drink their tea with lemon, and lemongrass, which has a red berry/sour- bitter taste, grows on magnolia vines in the woods, and is considered useful for the stabilization of blood pressure. On other thicker and longer vines grow sultana grapes (Actinidia), which is a green berry, similar to a large grape, but when sliced resembles a kiwi. Other “forest” dishes include pine nuts and the Manchurian walnut, which is considered a relative of the walnut. Vladivostok has many anglers who catch smelt and saffron cod in the winter, flounder and rudd in the spring and summer, herring in the autumn and squid at night. When the water warms, Vladivostok residents dive into the sea in masses seeking shellfish. The scallop, a bi-valve, is considered to be the most delicious of all, and it is often eaten raw with a splash of soy sauce, a Vladivostok staple. Recently, the scallop was not sufficiently populating the shallow waters, so many switched to gathering mussels, which are found everywhere in shallow water. Mussels are found everywhere in shallow water. Source: Lori / Legion-MediaVladivostok even has oysters in its waters, and they, as writer Anton Chekhov noted on his way back to the convict-town of Sakhalin in 1890, were bigger than their European counterparts. One can eat here the bright orange insides of sea urchins, which are considered especially useful for men. Trepang holds a special distinction, and is often obtained via poaching. People cook it, dry it, and make a tincture with honey out of it. Moscow myths about cheap salmon roe and crab in Vladivostok are unfounded. But the good news is that you can find fresh, quality caviar. It costs 2000-2500 rubles per liter (at the “Sportivny (Sports)” market and “Bereza (Birch)” market). Many locals have the telephone numbers of the most well-known Vladivostok poachers; to violations of poaching laws in Vladivostok, the adventurous often turn a blind eye. Sometimes, though, the police do take action. Yet right on the roadside here and there are cars with the signs that read “Seafood.” Caviar, crab, and shrimp are traded out of these cars and usually without any documentation. In addition, seafood is available through the popular online flea market farpost.ru. Unfortunately, fish markets in Vladivostok are inferior in scope and biodiversity to similar markets in Busan, Korea or Osaka, Japan. Primorye Governor Vladimir Miklushevsky announced plans to build a fish market in Vladivostok in the next few years that would not be inferior to neighboring countries. He decided to introduce to the “Starfish” badge of honor, made in the form of that marine animal, which would be awarded to outstanding residents of Primorye Territory. There are a variety of Chinese restaurants to explore in Vladivostok. First, there are widespread so-called chifanki (from the Chinese chifan “is”), which are everyday small cafes. Prices are very low (although generally Vladivostok is an expensive city, considering the price lists of local restaurants), and the staff are super friendly. In chifans, they go by the “reverse tip” principle, meaning that customers are given discounts or presented with symbolic gifts. You can try “baijiu” – Chinese vodka made from sorghum grain, which has an unusual taste and takes a bit getting used to for lovers of Russian vodka. There is a demand for the Chinese beer Harbin. Its manufacturing plant was founded in 1900 in the eponymous city (it was then the capital of the Chinese Eastern Railway and was considered more Russian than Chinese) by the Russian businessman Rublyovsky. The place where you can find the highest concentration of chifans is the market area near Sportivnaya, but there are some in every suburb. As for Korean cuisine, Vladivostok has both South Korean and North Korean restaurants (e.g. “Pyongyang” on Verkhneportovaya St.), which is interesting from both a gastronomical and cultural point of view. However, you don’t have to go to restaurants to get a taste of Korean food: fast food is popular in Vladivostok, including steamed cakes with cabbage, meat and pepper called “pyan-se”, which are sold at bus stops. It is Korean dish adapted for Russian tastes invented in Kholmsk (Sakhalin Island) by ethnic Koreans living there since the days when Sakhalin was Japanese. Korean vegetable salads, spicy cabbage kimchi, and dried seaweed and spices are also popular in Vladivostok. Korean vegetable salads and dried seaweed and spices are popular in Vladivostok. Source: Lori / Legion-MediaJapanese restaurants in Vladivostok hardly vary from those in other cities, but at the local car market Zeleny Ugol (Green Corner) (around Admiral Yumashev and Neybut) one can buy Japanese alcohol, including Suntory and Nikka whiskey, imported the "gray" way. Well-liked are also the Japanese beers Sapporo and Kirin, and Meiji chocolate. If we talk about local products, the Primorsky Konditer factor (company store is located at 52 Aleutskaya St.) makes a chocolate with seaweed and sea salt that is popular with guests. Then there is the recently opened Portcafe restaurant (on Komsomolskaya Street), which specializes in Far Eastern seafood, taiga, and other Asian-influenced food. The stores have alcoholic infusions with the addition of native plants and seafood. We also must mention another local product, “khimka,” derived from wild hemp and mixed with tobacco (khimka is mentioned in the local musician Ivan Panfilov’s hit song “Sea water,” which became the unofficial anthem of Vladivostok). We report this solely to give the reader a complete picture, and also remind that even soft drugs in Russia are prohibited by law.